Gordon Kirby Hignell was the son of Gordon Kirby Hignell and Margaret May (nee Thompson) Hignell. He was born in Carberry, Manitoba. He liked swimming and fencing. He had one brother: Edward, 28. He was the husband of Marion (nee Smith) Hignell, of Saskatoon, Sasktachewan. They were married November 8, 1941 in Saskatoon, and she later moved to Winnipeg, Manitoba. The family attended the United Church. At No. 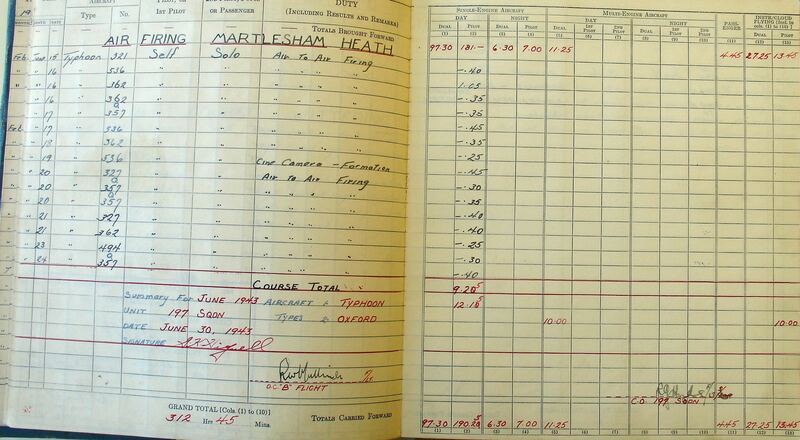 3 ITS, May 28 - July 3, 1941: "Fair educational background. Neat. Alert. Rather quiet. Easy going. Pleasant personality. Cheerful. Average type." At No. 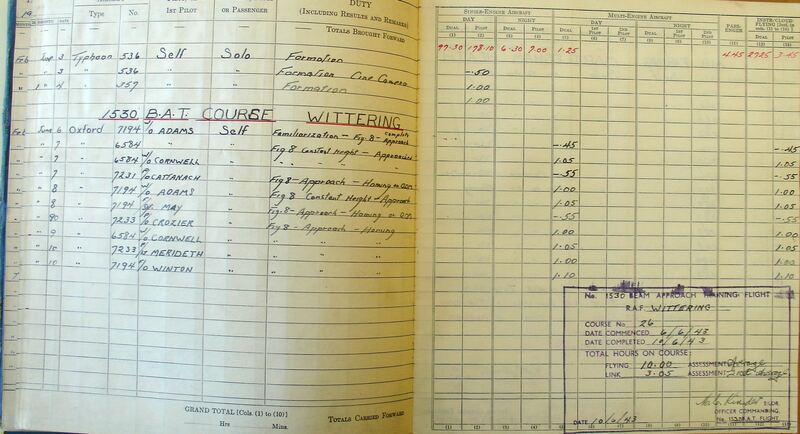 14 ETS, July 3 - August 20, 1941: "Fairly good student but is inclined to become careless if not watched closely." In Ground Training: "A very steady and keen type of student. He is inclined to do things without thinking and should be watched for this." At No. 11 SFTS, August 20-November 7, 1941: "A hard working average pilot, slightly nervous temperament, low on instrument flying, but no outstanding faults. Pleasing personaity. Started out poorly, but improved greatly during last half of course. Not very self confident yet but will improve with experience." He was awarded his Pilot's Flying Badge on November 7, 1941. Hignell departed Canada on December 9, 1941 and arrived at 3 PRC on December 19, 1941. 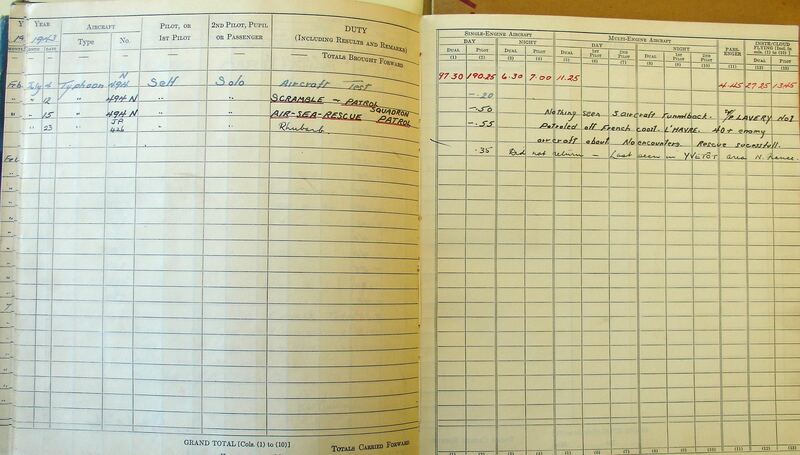 He was at the M. E. Pool from January 8,, 1942 until he was sent to the M.E. Pool at Amriya in May 1942. 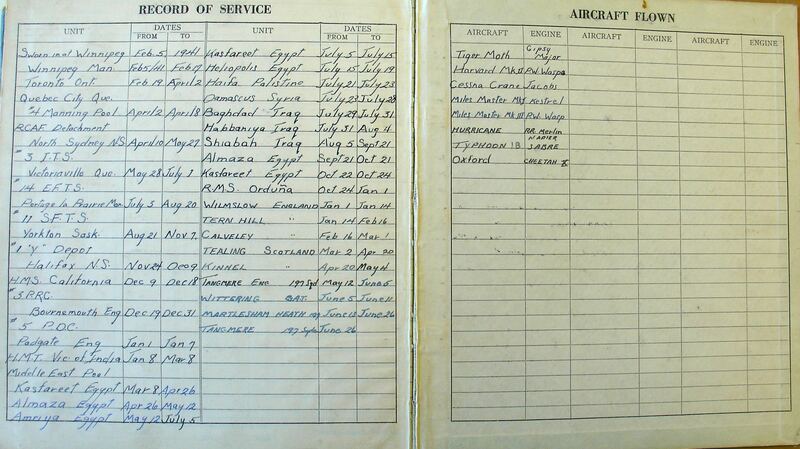 He was sent to Iraq July 20, 1942, the to RAF Shaibah, August 5, 1942. He was back at 5 (P) AFU January 14, 1943. 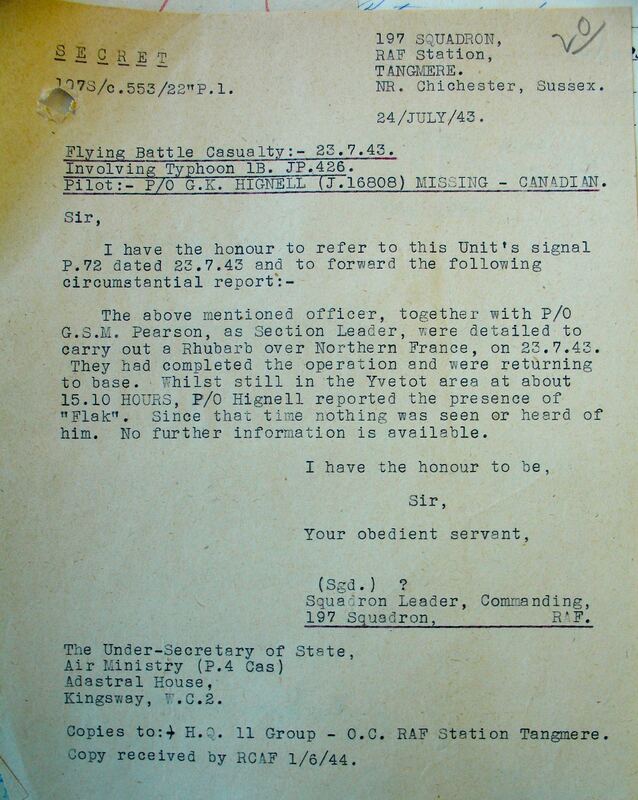 He was at 56 OTU March 2, 1932 and assigned to 197 Squadron May 10, 1943. On July 23, 1943, P/O Hignell was detailed to take part in a ground strafing (rhubarb) operation over enemy occupied territory in northern France in Typhoon 1B JP426. He reported the presence of flak Hignell's aircraft did not seem to be in trouble, according to the pilot of another aircraft in the same formation. 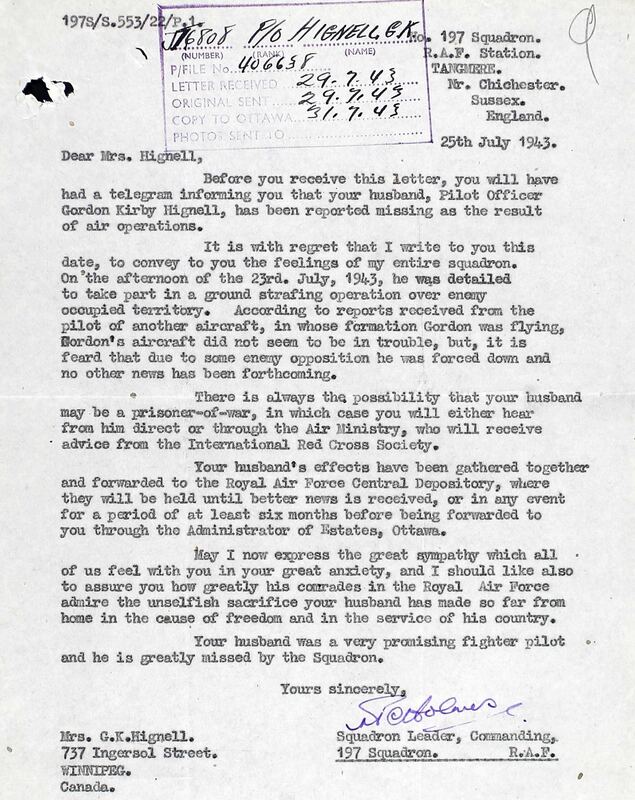 But it was feared that due to some enemy opposition, Hignell was forced down. There was nothing more heard from him. 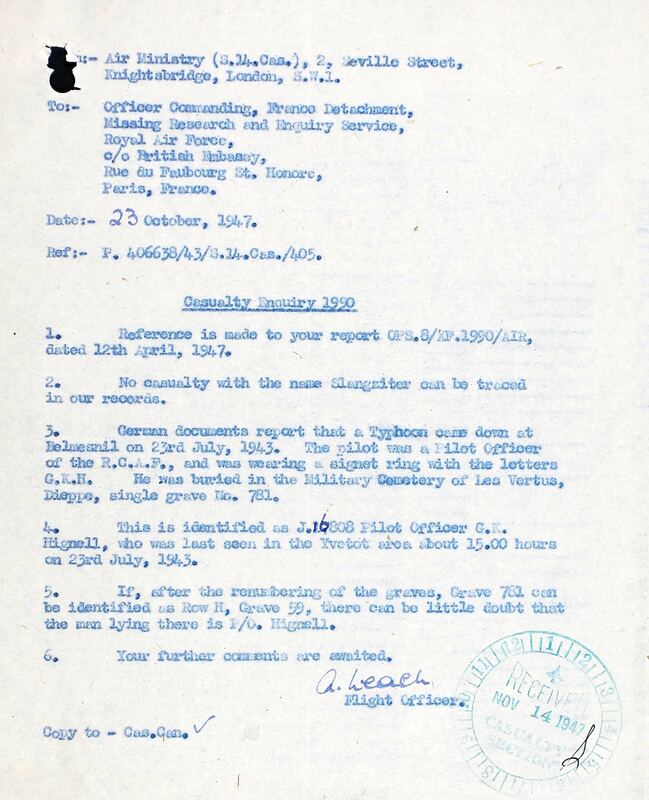 German documents reported that a Typhoon came down at Belmesnil on July 23, 1943. The pilot was of the RCAF and was wearing a signet with the letters G.K.H. He was buried in the Military Cemetery of Les Vertus, Dieppe. He had last been seen in the Yvetot area, 25 miles SW of Dieppe about 1500 hours. In April 29 1947, Hignell's body was exhumed and placed in the Hautot Sur Mer Canadian War Cemetery. "The few remains left go to confirm the marking on the cross that the grave contains a Canadian airman." 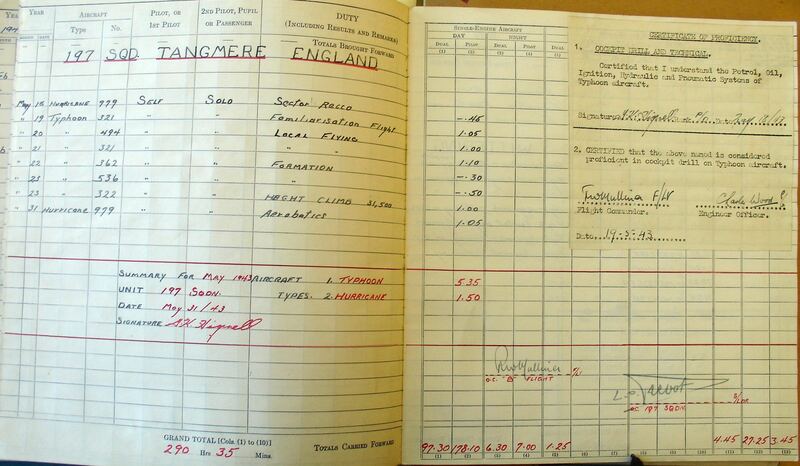 Within his files at the LAC, both of his logbooks were located! It seemed as though they were sent to his mother, but were unable to be delivered and returned to the RCAF. See entries from his books above.